If climbing and drinking with some cool people weren't enough. 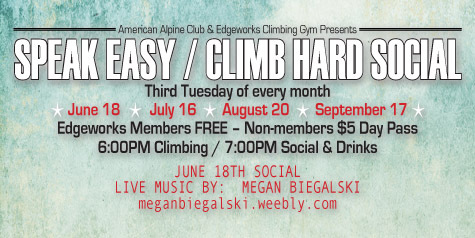 June's social will feature live music by Megan Biegalski. The Rock Climbing Round Up events are a perfect outing for any Scout Troop. We just reviewed the Black Diamond Momentum 3S Harness. Check out our video review on and see why we love this harness. Put the time in. If you want to improve your climbing, there is no substitute for time on the wall. Edgeworks Climbing is proud to offer climbing camps for beginner, intermediate and advanced climbers of all ages!